Just a note to let you know that I received my Portrait Workshop (MPD2) today and I can't believe what a great package you have put together! Thank you so much. Thank you so much for the Mastering Portrait Drawing 2 package. My copy arrived in the mail today. I've been watching all day. I just can't step away from it. The Bonuses are truly bonuses. I especially appreciate how you concluded with a page in one of the CD's naming the landmarks for the drawing of the neck. I want to be able to say the names of the landmarks as you do. The printed sheet will help me out a lot. I also believe because of this total package I will become a better painter. I can't say enough. This is something I am proud to add to my library. This is quality!!!! All of your hard work paid off. I finished viewing Mastering Portrait Drawing 2; let me tell you, you did a great job. It's easy to follow and understand and you cover so much material. I like your honesty when something is not correct in your drawing, you let the viewer know and you make the corrections. You have provided so much study material with the added bonus disk. Thank you so much, I can't wait to see what your next project will be. I have been a practicing artist throughout my long life. I have gone to various art schools (including The Art Student League), workshops and seminars, have read innumerable art books and magazines and have worked in all types of media. Through it all, I continued to have the same frustrations in drawing portraits. Through practice I got somewhat better, but never felt accomplished. My friend, Janet Walsh, told me about your DVDs and CDs and urged me to give you a try. I can't thank her enough because your instruction is wonderful...you structure each segment, you explain and show, you build on prior lessons, and you speak the language of art. You are exactly what I need to grow and strengthen my art skills. As I have read and experienced many times, when the student is ready, the teacher will appear. I have just ordered some additional DVDs and CDs to add to what will be a year of joyous learning! And best of all, you really understand that art is a meditative process where we are fully in the present moment. The second of my Mastering Portrait Drawing Series of workshops. Part one introduced you to all the fundamental techniques, methods and knowledge you need to successfully draw beautiful realist portraits in the Frontal Pose. Now we take you on the next step of the journey and teach you all the procedures and know-how you will need to excel at the fine art of realist portraiture in the profile views. Step by step you will learn in-depth the secrets to the mastery of the 7/8 profile view - the favored profile of Masters for it’s three dimensionality, it’s movement, it’s elegance, emotional quality, and timeless appeal. If you loved Mastering Portrait Drawing1 and have been studying diligently, you are going to be doubly thrilled to get started on the popular 7/8's profile view in Mastering Portrait Drawing 2 now that you have the basics down. Where to start, how to finish, and much more. Mastering Portrait Drawing: The 7/8's Profile is designed specifically for those who have studied my Mastering Portrait Drawing 1: The Frontal Pose Workshop. 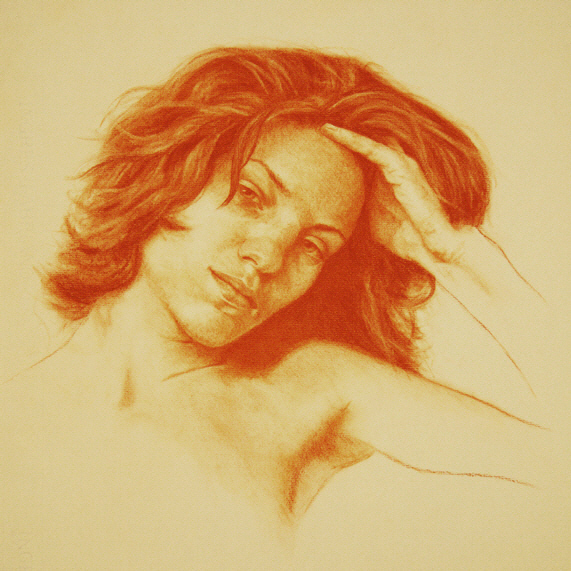 The concepts presented in Mastering Portrait Drawing 2 are more advanced and indepth. The anatomy of the head and facial features are more detailed and refined. A thorough understanding of the anatomy of the head, face, neck and upper torso is critical to furthering your skills. 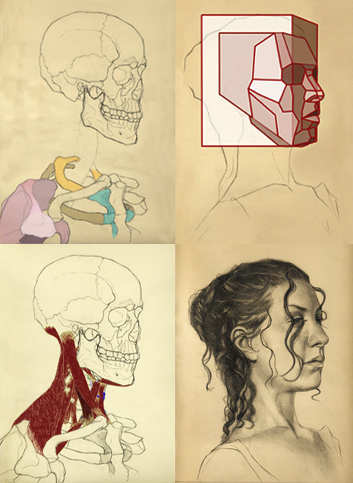 Beginning with the the skeletal structure each bone and significant landmark is presented from the deepest rooted muscle to the myriad superficial forms that comprise the 'landscapes' of portrait and figure drawing. The shoulder and neck is an area that is often neglected. Unless one endeavors to limit themselves to drawing floating heads convincingly drawn shoulders and necks are necessary. 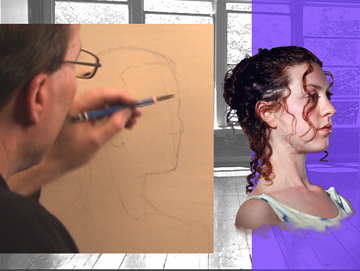 Again, the neck and shoulder's anatomy is built up and presented step-by-step. The facial planes specific to the 7/8's profile view are, too, built up step-by-step, plane-by-plane. Understanding the planar concepts and applying these will further a 3-dimensional, sculptural quality to your portrait drawing. Take your drawing to the next level! 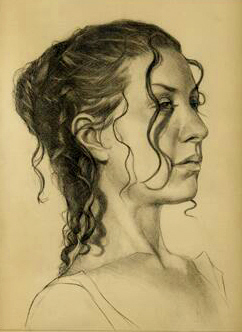 Mastering Portrait Drawing 2: the 7/8's Profile is only $57.00!